“Heroin overdose death rates increased by 26 percent from 2013 to 2014 and have more than tripled since 2010,” says the January report from the U.S. Centers for Disease Control and Prevention. More than 47,000 people died from drug-overdose deaths in 2014 alone, including 28,647 from opioids and heroin overdoses. Nearly all of the heroin used in the U.S. is brought across the border by Mexican traffickers, who are nearly always illegal aliens. 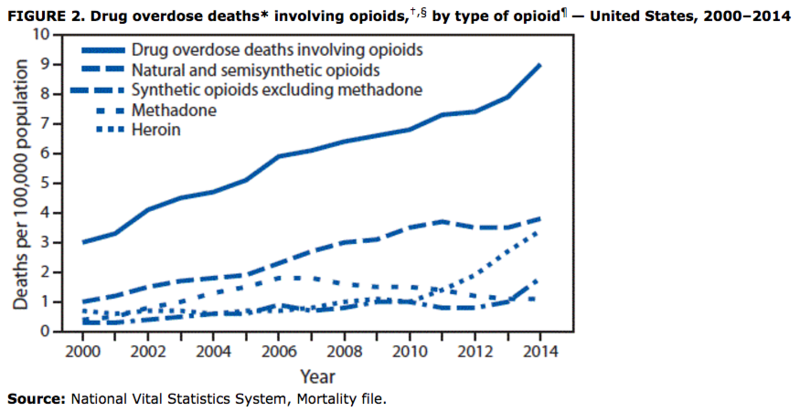 More persons died from drug overdoses in the United States in 2014 than during any previous year on record. From 2000 to 2014 nearly half a million persons in the United States have died from drug overdoses. In 2014, there were approximately one and a half times more drug overdose deaths in the United States than deaths from motor vehicle crashes. Opioids, primarily prescription pain relievers and heroin, are the main drugs associated with overdose deaths. “In 2014, the five states with the highest rates of drug overdose deaths were West Virginia, New Mexico, New Hampshire, Kentucky, and Ohio,” according to the CDC. West Virginia in particular is saturated with painkillers: Drug wholesalers poured 780 million hydrocodone and oxycodone pills into West Virginia in only six years, meaning there were 433 painkillers for every single person in a state with a population of only 1.84 million. During that time, 1,728 Americans in the state died from overdoses on those pain pills. The CDC says prescription opioid deaths have steadily increased while overdoses from illegal drugs have recently surged, especially due to heroin. The easy availability of opioids has made the prescription-addiction-death spiral difficult to combat, according to the government. The increased death toll may also be shaped by President Barack Obama’s campaign to release more drug-dealers from prison. Otis labeled Obama’s unprecedented effort to reduce the sentences of drug traffickers, many of whom are armed convicts, as a signal to felons that they can continue to deal illicit narcotics. I don’t know how many of Obama’s roughly 1,700 clemencies were specifically for heroin dealers; some were certain to have been. But the great majority were for dealers in hard drugs of one kind or another. Thus, what Obama gave us—and I hope [President Donald] Trump and Sessions will reverse—is the message that the cost of doing business in the drug trade will be going down at exactly the time that the damage (often lethal damage) to ordinary citizens stemming from drug use is going up. Trump repeatedly declared that the U.S. must stop heroin from “poisoning our youth” on the campaign trail, releasing a policy paper detailing his plans to combat the drug epidemic in late October.